ICT and eHealth has the potential to radically improve prehospital care in many aspects. However, in order to achieve sustainable success in development, innovation and deployment new approaches to collaboration among all stakeholders involved is needed. Prehospital ICT Arena was formed in 2014 to meet the needs and challenges. It is a neutral, open arena applying the principles and ideas of Open Innovation, where health care, business and academia join forces to improve prehospital care by promoting utilizing of ICT and eHealth in the most efficient way. The Arena was the result of a 2 year long preparatory project, Metis, where a group of individuals with various background and experiences in industry, research, open innovation, prehospital care etc. joined forces with numerous stakeholders including MedTech West to find new ways to promote an improved utilization of ICT and eHealth in the prehospital sector. The common denominator was – things are happening too slow, let´s find ways to improve healthcare, business and patient outcome, i.e. develop this branch of health care with ICT. Prehospital ICT Arena is operated and administered by Lindholmen Science Park in Gothenburg, which has great experience in running open arenas. More than 30 organizations, MedTech West being one, are involved in the collaboration platform. The common vision is to eliminate obstacles preventing ICT and eHealth to be used to its full strength within prehospital care. This is achieved through joint projects, and dissemination of experiences, knowledge and research in various relevant areas. 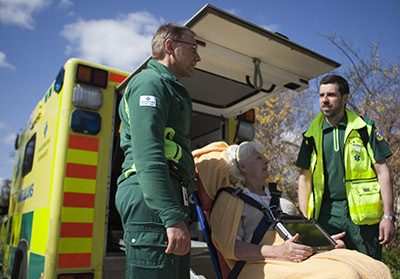 Prehospital ICT Arena cover the entire care chain; from an incident that requires medical assistance until the patient is transferred from the prehospital setting to next appropriate care level; being a hospital, primary care or the persons own home. Metis Forum is an important tool in the tool-box of Prehospital ICT Arena. It is an open meeting place, a forum, where all stakeholders meet to exchange knowledge and experience, and discuss ideas for projects. These ideas are processed and refined within Prehospital ICT Arena into concrete project proposals, which in-turn can seek funding from various sources. A good example is the project PrehospIT-Stroke which, among other things, aims to create a basis for effective exchange of information supporting better care along the complete acute stroke-chain by harmonizing semantical and technical interoperability. The arena is financed by Region Västra Götaland and contributions from the arena stakeholders.